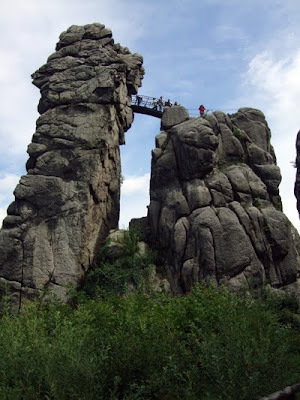 The photos above and below show the Externsteine, a massive rock formation in northwest Germany consisting of several tall, narrow tors that rise out of the surrounding wooded hills. They are popular tourist attractions - sometimes called Germany's Stonehenge, although the Externsteine are natural rather than built by man. Considerable mystery surrounds the stones' past. There is a historic Christian chapel at the site, but many people believe they were also a place of worship by ancient pagans even though no archaeological evidence of it has been discovered there. At the top of the tallest stone is a chamber that appears to be an altar. Directly above the altar stone a circular hole is cut into the wall, facing the direction of sunrise at the summer solstice. 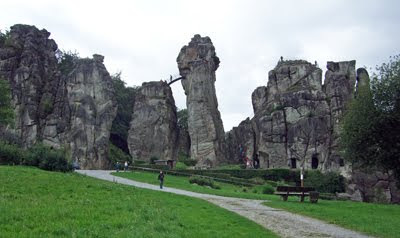 Controversy over the Externsteine increased after Nazi occultist and archaeologist Wilhelm Teudt and head of the SS Heinrich Himmler set up the Externstein Foundation in 1933 to investigate the stones and potentially use them for ceremonial purposes.